In the 19th century beer was the favourite drink of the working classes because it was strong and inexpensive. It was sold in variously sized wooden barrels, which were kept behind the counter or in the cellar of Victorian public houses. 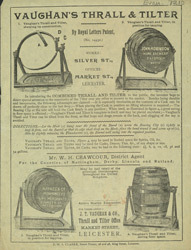 Stands and barrel holders such as the one featured in this leaflet ensured that the beer could be easily drained.